Losing a limb, whether by amputation or otherwise, can be a jarring experience for a person and for their body. Learning to function without a limb or with a prosthetic replacement can be a long and difficult process. That’s why researchers are seeking to make the process easier. Scientists working out of Ecole Polytechnique Fédérale de Lausanne (EPFL) in Switzerland have come up with a new technique to assist amputees in learning how to use their prostheses. 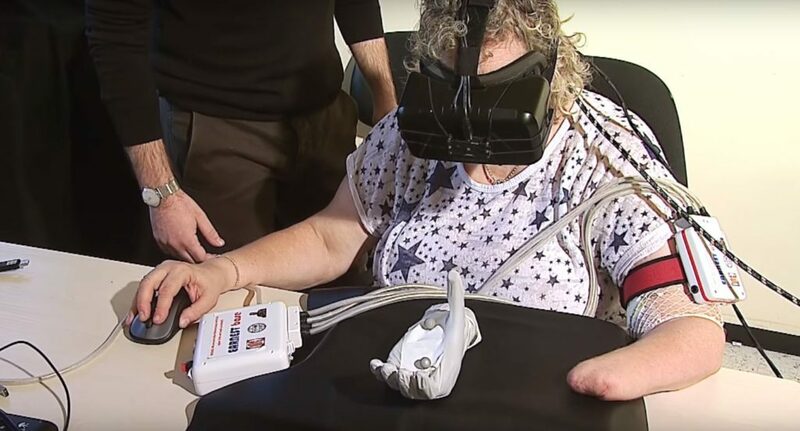 It involves the use of virtual reality to stimulate the brain in connecting the new physical prosthesis to the old limb sensation. When a person loses a limb, he or she often experiences a sensation sometimes referred to as a “phantom limb.” This results in an amputee feeling sensations where the limb once was, as though it is still there. Of course, it isn’t, but EPFL seeks to make use of this phenomenon by tailoring the feel of a prostheses to closely match the phantom limb. Neural stimulation is used to help make the match happen in the brain. Normal prostheses don’t offer the sense of touch, and they often are built simply to mirror the size of the missing limb. This is an issue because the phantom limbs perceived by amputees often feel quite a bit smaller than the original limb. Because of this, the Swiss researchers at EPFL sought to change how an amputee perceives the prosthetic he or she is using to make it feel more like the original limb rather than simply look like it. The senses of sight and touch are manipulated to trick the amputee’s brain into perceiving the phantom limb as the prosthetic, meaning it’s no longer a phantom limb at all, but rather an artificial one that can actually be felt. 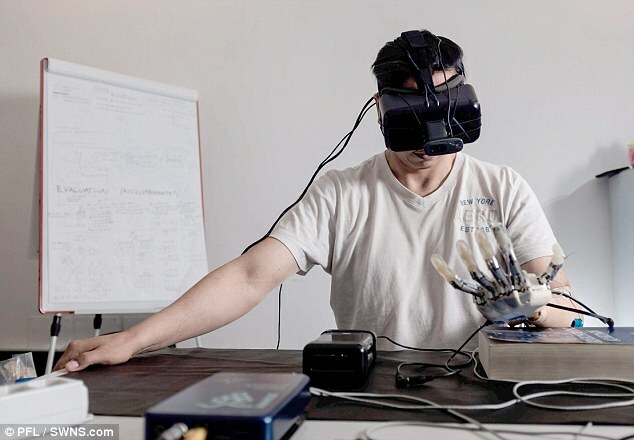 The amputee wears a virtual reality headset that displays the virtual representation of their real prosthetic limb. A stimulus is applied to the nerve in the amputee’s remaining anatomy, and the illusion of a finger in the phantom limb experiencing a sensation is created. As this happens, the digitally displayed finger on the prosthetic hand glows, allowing the amputee’s brain to connect the two. 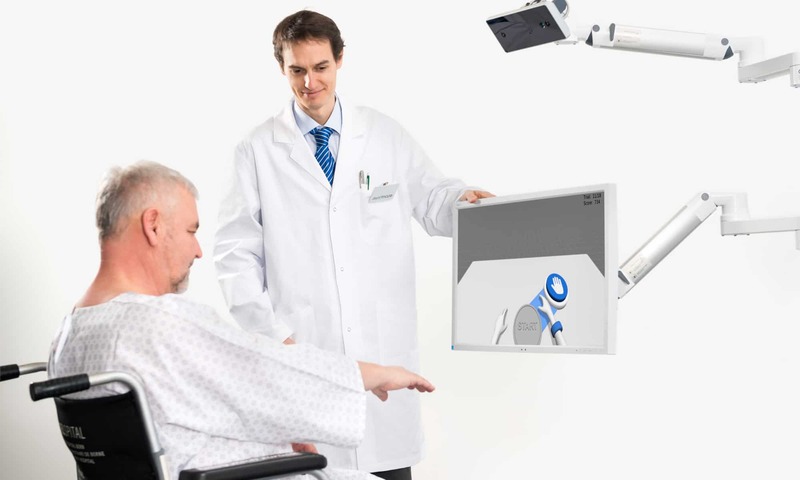 This allows the virtual reality application to train the amputee to perceive the phantom limb and the prosthesis as one, a valuable tool in the effort to make life as normal as possible for someone who has lost a limb. For more information on EPFL and their work with phantom limb sensations, please read this article: Amputees feel as though their prosthetic limb belongs to their body.